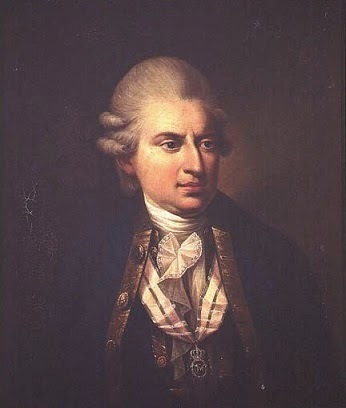 Today we mark the death of a polarising figure in Scandinavian court politics, Count Johann Friedrich Struensee. My post on Queen Caroline Mathilde, right back in the early weeks of the Guide, remains a popular item almost a year after it was first published and I thought it might be germane to revisit this turbulent story, with a look at the final act of the life of Struensee. 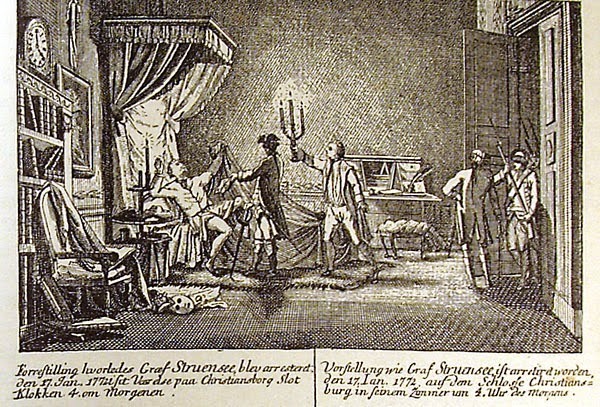 Struensee was brought into the Danish court to quell the eccentricities of King Christian VII and his decision to emply the doctor was initially applauded by his counsellors, who saw the physician as a much-needed stabilising influence. In fact it was to prove a pivotal moment in the history of the Danish monarchy, shaking the house of Oldenburg to its foundations. 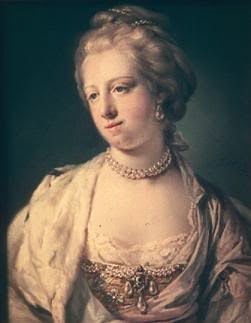 Within a year of Struensee's arrival at court the unhappy Queen Caroline Mathilde and Struensee were lovers; as the king decended deeper into madness, so Struensee's influence at court increased until, in late 1770, he was elected privy counsellor. By the time of Struensee's rise to power the king was confined and often incoherent, so his former doctor enjoyed a period of virtually unchallenged authority, initiating over a thousand reforms that began with the total restructure of the unwieldy Danish cabinet. One might have expected Christian to be disturbed by these developments but in fact it was the opposite; he delighted in the unusual arrangement, glad to see his wife happy, his own marital responsibilities discharged and the burden of government business lifted from his shoulders. However, the ruling classes did not share their monarch's delight and when the queen gave birth to a daughter who was assumed to be Struensee's child, they moved in earnest against him. Facing higher taxes, reduced privilege and more reforms than they knew what to do with, the cabinet and court turned against the queen and her lover, their previously anaemic support for Christian returning with a fervour. On 17th January 1772, Caroline Mathilde and Struensee were arrested. Struensee was charged with usurping royal authority and subjected to interrogation and torture. He mounted an eloquent and passionate defence of his actions but the die was already cast and Struensee was sentenced to have his hand severed and then to be beheaded, drawn and quartered. He was held in readiness for execution at Kastellet in Copenhagen and on 28th April was conveyed to the scaffold. Here the grisly sentence was enacted before an audience of tens of thousands. Queen Caroline Mathilde and her daughter were sent into exile in Celle, where the queen died aged just 23, never seeing Denmark again. It's my pleasure; thank you for visiting. I do like to mix the well-known with the less famous, there are so many interesting tales to tell! Glad to see someone writing about this today. Great post. A pleasure; thank you so much for your visit! Although romanticized,I feel that the film, "A Royal Affair" did justice to the events you describe, Catherine. I think so too, though everyone was far too pretty! So sad. And people are so cruel.